VW CEO Winterkorn said predictions beyond next week about the automaker's car production are impossible given the changing situation in Japan. 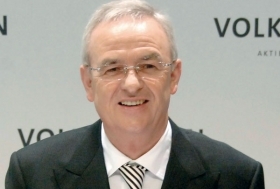 Volkswagen AG's production has not been hampered by disruptions at Japanese partsmakers because of the earthquake, CEO Martin Winterkorn said. "We are well supplied through next week," Winterkorn said Monday at a press conference in Salzburg, Austria. The CEO said predictions beyond next week are impossible given the changing situation in Japan. Ford Motor Co. plans to idle its auto plant in Genk, Belgium, for five days starting April 4 to conserve parts following the earthquake and nuclear crisis in Japan. A Ford spokesman said in an e-mail Tuesday that the shutdown had been set for May, but the automaker chose to idle the plant sooner "as a precautionary measure to ensure we have parts availability going forward given the current situation in Japan." He added that Genk's second-quarter production volume will not be affected by the pulling ahead of the down days. General Motors Co. and PSA/Peugeot-Citroen SA also have reduced production at factories in Europe due to disrupted supplies. PSA said Monday conditions are likely to gradually return to pre-crisis production levels at its plants starting on Thursday. It will take weeks to assess which parts are in short supply and to make plans for alternative sourcing, according to a March 22 report from analyst Morgan Stanley. Japan is a key supplier of electronic content such as semiconductors, sensors and batteries. Electronic content is estimated to be well over $5,000 (about 3,540 euros) per car, the report says. Europe's largest auto manufacturer set up a task force two weeks ago to ensure production at its 61 factories worldwide aren't impacted by possible stoppages at Japanese component suppliers. Volkswagen has no production facilities in Japan. Production at parts suppliers has been interrupted by the March 11 quake, with Denso Corp, Aisin Seiki Co. and Renesas Electronics Corp. suspending most or some of their manufacturing after the disaster. Nissan Motor Co. CEO Carlos Ghosn said last week about 40 parts supplier in Japan remain hampered after the quake. Winterkorn said the Wolfsburg-based carmaker may be able to switch suppliers should deliveries from Japanese partsmakers face disruptions. "There are hardly any single-source situations," the CEO said at the press conference to mark VW's takeover of the Porsche Holding, which is Europe's largest dealer group. "There is the possibility to quickly get capacities from other sources within a clear timeframe via other shift models or weekend shifts to compensate for this." VW may post record deliveries this month, sales chief Christian Klingler said. Sales in January and February rose 18 percent to more than 1.2 million cars and SUVs, Winterkorn said March 10. VW is aiming to increase sales 5 percent in 2011 from last year's 7.14 million units.